Pedison USA, Corporation is a nationwide, commercial real estate mortgage financing firm, providing in-house originations, underwriting, funding of commercial real estate loans. 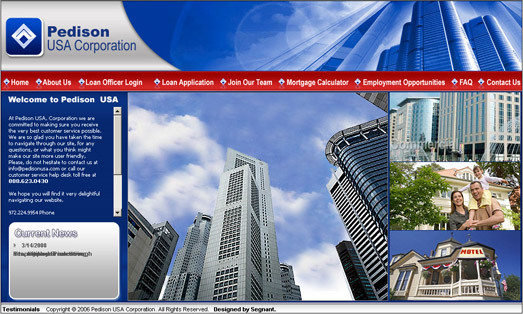 Pedison USA, Corporation flexible loan programs are designed to meet your critical business needs. As an excellent professional team with many years in commercial real estate financing, Pedison USA, Corporation has demonstrated a balance and stable business growth despite the many changes in the industry. Our goal is to maintain simple and extraordinary customer services, creating a cutting-edge professional system of operations suitable for anyone to acquire commercial mortgage loans. We accomplish this by maximizing our time and taking into consideration our customers’ valued effort and resources in getting the best possible result they deserve. Our financial success is attained by taking into consideration how we treat our customers.